A world in which “we do these things because they’re easy” has one end-state: collapse. Our national philosophy now is “we do these things because they’re easy”– and relying on debt to pay today’s expenses is at the top of the list. What’s easier than tapping a line of credit to buy whatever you want or need? Nothing’s easier than borrowing money, especially at super-low rates of interest. We are now totally, completely dependent on expanding debt for the maintenance of our society and economy. Every sector of the economy–households, businesses and government–all borrow vast sums just to maintain the status quo for another year. Compare buying a new car with easy, low-interest credit and saving up to buy the car with cash. How easy is it to borrow $23,000 for a new $24,000 car? You go to the dealership, announce all you have to put down is a trade-in vehicle worth $1,000. The salesperson puts a mirror under your nose to make sure you’re alive, makes sure you haven’t just declared bankruptcy to stiff previous lenders, and if you pass those two tests, you qualify for a 1% rate auto loan. You sign some papers and drive off in your new car. Easy-peasy! Scrimping and saving to pay for the new car with cash is hard. You have to save $1,000 each and every month for two years to save up the $24,000, and the only way to do that is make some extra income by working longer hours, and sacrificing numerous pleasures–being a shopaholic, going out to eat frequently, $5 coffee drinks, jetting somewhere for a long weekend, etc. The sacrifice and discipline required are hard. What’s the pay-off in avoiding debt? Not much–after all, the new auto loan payment is modest. If we take a 5-year or 7-year loan, it’s even less. By borrowing $23,000, we get to keep all our fun treats and spending pleasures, and we get the new car, too. At the corporate level, it’s the same story: borrow a billion dollars and use it to buy back shares. Increasing the value of the corporation’s shares by increasing profit margins and actual value is hard; boosting the share price with borrowed money is easy. It’s also the same story with politicians and the government: cutting anything is politically painful, so let’s just float a bond, i.e. borrow money to pay for what was once paid out of tax revenues: maintaining parks, repaving streets, funding pensions, etc. Borrowing more money from the future is easy, painless and requires no trade-offs, sacrifices or accountability–until the debt-addicted economy collapses under its own weight of debt service and insolvency. People keep repeating various versions of the story that “debt doesn’t matter” because “future growth” will outgrow the skyrocketing debt, or inflation will make it all manageable, or that central banks will do whatever it takes to make sure everyone has enough money to service their debt burdens: negative interest rates, helicopter money, etc. etc. etc. 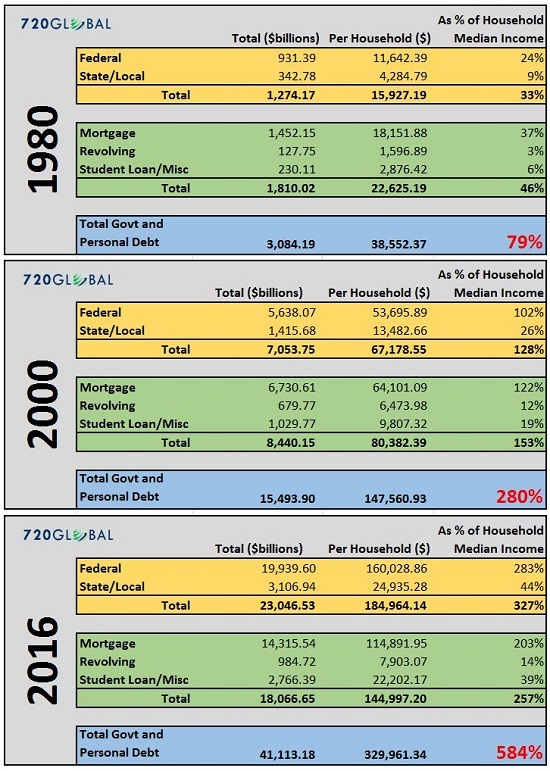 If you believe that going from a total debt burden (government and personal debt) per household being 79% of median household income to debt per household being 584% of median household income doesn’t matter and will have no consequences, you believe in magic. Unfortunately, thinking something will be easy forever and have no consequences is not the same as the real world of skyrocketing debt and leverage having no consequences. A world in which “we do these things because they’re easy” has one end-state: collapse. Believing that debt has no consequence, that the status quo is permanent, that all the promises based on soaring debt can be paid–it’s all an appealing fantasy, magical thinking at its most enchanting. Believe these fantasies at your own risk.